Melissa Stoddard, pictured on the left, is one of the murder victims who I keep writing about because I will always feel that she was ignored in the worst way by the Autism community after her murder. 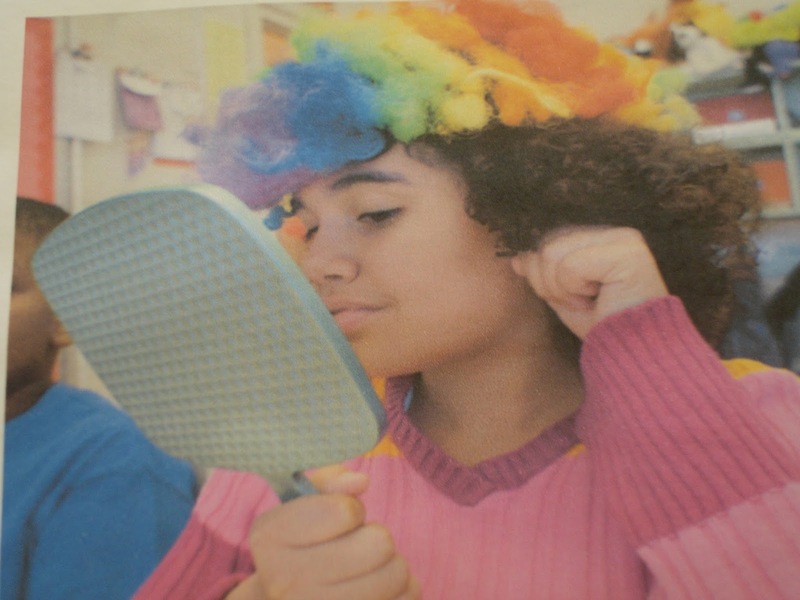 She is, to quote the Herald Tribune, “The Girl Who No One Saved.” A young and vibrant 11-year-old autistic girl, she was slowly starved, tortured, strapped to a board and left in an empty pool in her family’s backyard at all hours until she died. I will always be furious about the fact that Melissa was happy with her mother and her school in Greensboro, North Carolina, and that it was the very stepmother who abused and murdered her who called Child Protective Services on her intellectually disabled brother, accusing him of molesting Melissa. I believe the acts of Melissa’s father and stepmother witnessed and related by Melissa’s white stepbrothers should have been adjudicated as hate crimes. The Autism community that continues to roar in outrage at the commuting of Dorothy Spourdalakis' sentence for the brutal stabbing murder of her nonspeaking autistic son Alex simply did not care enough to pursue this. Could this be because she was not white but the perpetrators of her torture and murder were? The abuse, neglect, and murder of Melissa Stoddard are sadder in that everyone in Florida, regardless of political affiliation or approach to disability, was equally outraged by her torture and murder. Only the Autism community casts Melissa aside, with the exception of listing her name among the countless numbers of disabled people murdered by parents. Today, I'm reading in the news that there was a violent assault on a disabled white adult male presenting victim named in some news sources as Austin Hilbourn broadcast on Facebook live. The young woman who live broadcasted it and the suspects responsible have been arrested. The victim was taken to the hospital for treatment. The press seems to be spending very little time wondering about the state of mental and physical health of the victim. I have not seen the video of the assault nor read more than the barest details. But here is why I'm bringing this up today. Those arrested were charged with a hate crime. Should they have been? Well, of course, they should have been charged with a hate crime! Yes, this is a hate crime against a disabled young man done because of his disability and should be adjudicated as such. Yes, it was made worse by the anti-Trump slurs but those slurs were added to justify the crimes committed and are not the hate crime in and of themselves and this is critically important. This is not about Trump. This is violence against disabled people. Now is where I state emphatically, no, not every African-American teen in America is culpable for this crime. No, African-American youth is no more dangerous, hate-filled, violent or cruel targeting vulnerable victims than white American youth. We hear about horrific crimes of this nature against disabled youth every month. Many crimes go unreported because prosecutors won't pursue them or parents don't press charges against the criminals responsible. Let me digress a minute and give an example of another horrific crime against a disabled teen where the perpetrators also used a current event to draw attention to their act of violence and broadcast their crime on the Internet. Remember the horrific ice bucket challenge assault on an autistic teen in Ohio? The perpetrators also filmed and broadcasted their horrible assault. The victim's parents insisted on allowing the broadcast to remain on the Internet, and their solution to this crime against their disabled son, evidence of their own ignorance and ableism, was to endanger more autistics instead of punishing the guilty by insisting the criminals perpetrating the assault be given community service to autistic people instead of prison time . Innocent autistic youth were placed at further risk of emotional harm from these individuals. The wrongheaded idea autism parents have that somehow those who visit physical harm on their children should get to know them in order to understand and possibly befriend them upsets me deeply. Our offspring are not hopeless charity cases so desperate for friendship that those who abuse them should be allowed to continue doing so. The ice bucket challenge assault, like a similar case of months of torture to an autistic teen filmed by two girls who convinced him to go along by claiming they were his girlfriends, should have been adjudicated as a hate crime against a disabled person. But those who perpetrated the crime and filmed it where white, thus the language used for the assault was not assault but "prank gone wrong" and those who committed this crime were not labeled criminals but called bullies who just needed 'autism awareness.' Autistic youth was presented to the public as a pitiable group, to be looked down upon. This is a variety of victim-blaming as this young man's disability was made an excuse for the criminal actions of his attackers. The demand for hate crime status in the wake of the Alex Spourdalakis murder presents a new set of ethical issues to our community. If the equally gruesome murders and assaults of countless nonwhite disabled victims like Gilberto Powell and Melissa Stoddard prompted no effort or demand for hate crime classification. and therefore were not adjudicated as hate crimes, then the outcry at this point for hate crime status is again, a matter of the racial makeup of the victims and the perpetrators rather than the severity of the crime. We need to define what we as disability rights activists will do when a crime against any disabled victim, white or nonwhite, should be adjudicated as a hate crime but is not. 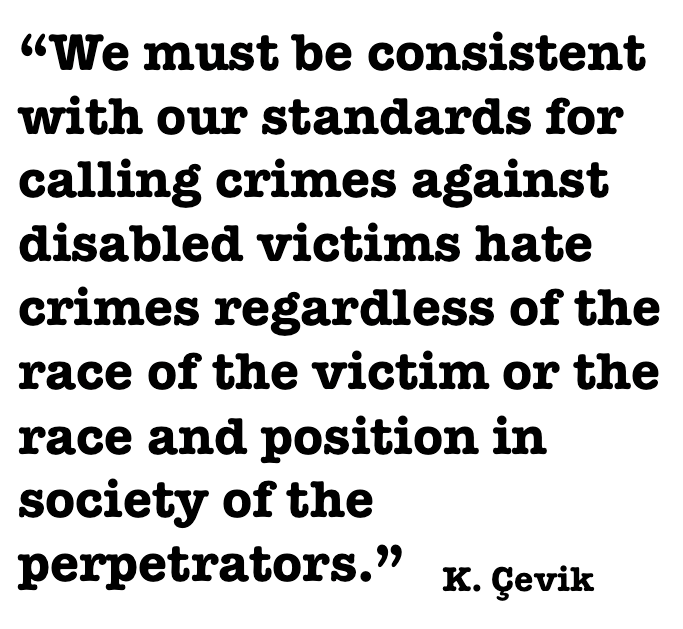 We must be consistent with our standards for calling crimes against disabled victims hate crimes regardless of the race of the victim or the race and position in society of the perpetrators. Violence against every minority has increased in the aftermath of Trump's election. It is imperative for everyone in the disabled community to seek safety in new, united, ways not sought after before. Everyone caught up in this polarized glorification of hatred will seek to harm those who appear to be the most vulnerable targets. To the African American perpetrators of this hate crime: hatred is not the way to hold the President-elect or the racist white supremacists' organizations who backed him accountable for anything. What you have done to this innocent young man is that much more heinous because it harms him as an individual and harms the disabled communities and the African American community. This horrific thing that all of you did and broadcast can now be used to justify all the excessive use of force by police against Black communities across our nation. It can be the excuse for Trump to do any manner of things to us, all from your ignorant act of naked hatred perpetrated on an innocent victim. You may wish to harm yourselves, and that is your choice, but you have no right to harm so many others. 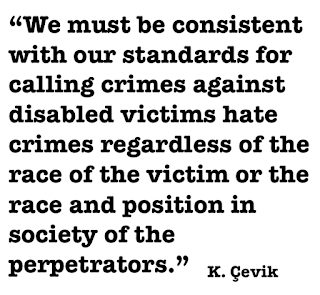 In our rush to declare these acts of violence hate crimes, let us ensure that we are shouting with equal vigor for every member of our disabled community. Remember, do not allow current racial polarization to hijack the case here. This is an act of violence against a disabled person, despite all the libelous attempts to brand it outlandish things like a Black Lives Matter kidnapping. More crimes like this should be tried as hate crimes, regardless of the race of the perpetrators, not only when the perpetrators are a racial minority shouting anti-Trump slurs. Melissa Stoddard and Gilberto Powell deserve that and more, they deserve our continued remembrance and support. They don't get it. Let's hope that changes.